It's getting worse after I bleached half-bottom of my hair to make it ombre. My first ombre hair was just dark brown to brown and that doesn't require any bleach. The second ombre was from dark brown to red as you can see here. Now that requires bleach. Bleach makes my hair ends even more dry than they were before. So I decided to use hair mask as conditioner. I forgot where I first heard about Korres but when I saw that Korres is available at Luxola, I got excited and browse around. I found this hair mask and I really wanna try it but it was too expensive for something I'll use almost everyday. Actually the Almond and Linseed hair mask is formulated for dry hair and actually I have oily scalp. Knowing that I'll just use this mask on the dry and damaged part, I waited until there was a sale and grab this baby immediately. It's thick cream, but easily spread to cover the hair. The consistency is like normal conditioner. It smells like strong almond and something I don't know. Maybe it's the linseed. It smells natural but too strong to be all natural, but it doesn't smell that much artificial although I know it contains perfume. I don't use too much because I use it as (not so) daily treatment, I guess my hair can absorb nice things in it almost everyday so I don't need to put too much (and you know, IT IS EXPENSIVE DARLING ← honest reason). I put this first then shampoo my roots so it has more or less 3 mins to nourish and after that I rinse all of my hair. It's not hard to rinse, just make sure you leave no residue. But I don't regret buying it because the result is there! My hair ends are softer, not as soft as top half of the hair, but it's definitely better. When I comb my hair, I have minimum tangled hair and that helps for the hair loss part (my hair loss problem is freaking annoying. I lost a lot of hair. This needs another post). I've used this hair mask for about 5 months (alternatively with another cheaper hair mask), and my tube is now in critical phase a.k.a. I almost run out of this product. I need to repurchase this.. But I'll wait until Luxola throw another big sale lol. Korres Almond and Linseed Nourishing Mask is available on Luxola (Rp335.100 for 125ml). Although I said that eyebrow powder gives me confidence, I don't buy too much eyebrow products. In fact, I only have two eyebrow powders and one eyebrow pencil that I got from a beauty box that doesn't match my hair at all. This one is the one I use the most. The packaging is not very fancy, just glossy black rectangle with silver fonts. It's nice and feels sturdy but I have to say that I hate the lid because it's totally loose. No hooks, no magnets, very easy to open. I can't bring this to travel unless I want to tie a rubber band around it so it won't open and mess around in my makeup pouch. I think rubber band is just too much hassle, better buy another eyebrow product haha (that's why I have two eyebrow powders, this one stays home, the other one running here and there with me in my bag). This kit consists of 3 brow powder and one wax. The website says that you can use the palest shade to highlight but I think the palest shade is not pale enough to highlight anything. But you can use the palest shade for your eyebrows too, tho, if it matches your hair. I mix two powders on the first row for my eyebrows. It comes with a huge mirror that's really convenient if you wanna do touch-ups, a tweezer, and a dual-ended angled brush. Sorry the tweezer and the brush is not in the picture because I forgot where I put the tweezer and the brush looks super filthy. The tweezer is quiet nice, but it's a lil bit hard so you need to put some force to pluck your eyebrow. The brush is nice, it's stiff enough so I can draw my brows easily. And because it's dual-ended, I use one side to apply the wax and the other side to apply the powder. Just a few strands tho. I think the color is very nice. I'd love to dye my whole head with this color but I have no guts to bleach my whole hair :| Maybe next time I'll dye all of my bleached hair with this color, it's just too pretty! Is it weird if I say I have holy grail product for my feet? Because I have hahaha. This foot scrub from The Body Shop is my holy grail foot scrub. If I ran out of it, I'll go to The Body Shop and buy this again even if it's not on sale. For me it's a big thing lol because I only buy things when they're on sale if I think the product isn't that necessary. It has peppermint smell, of course, which makes your feet smell fresh. Not that I smell my feet but you know what I mean, don't you? The texture of the scrub is kinda fun. The brand new surface is jelly like, I love to touch it xD it's like PYONGPYONGPYONG. I'm sorry that sounds childish but I'm not really good at describing things hehe. The scrub itself is quiet gentle, compared to some body scrubs out there that can scratch your skin with their sharp beads, but it's not too gentle that you can't feel it's not working. For Indonesian readers, Peppermint Smoothing Pumice Foot Scrub is Rp149.000 for 100ml and available for purchase on The Body Shop Indonesia's website and every The Body Shop stores. For international readers, you can get the scrub easily at your local The Body Shop stores or their website for online shopping. OMG time flies, eh? I just realized I haven't post this photos.. The event was a month ago! I accompanied my sister to GLAMGLOW's boutique opening party. The event was held at Moovina Plaza Indonesia. The boutique itself is not far from Moovina. I don't have pictures of the event but I have OOTD pictures hehehe. The dress code for the party is Hollywood Glam. Thank god Angelina Jolie wore suit to BAFTA so basically I just followed what the queen has done. Me with the co-founder of GLAMGLOW, Glenn Dellimore. He is very funny and good story teller! My most inexpensive item is Mizzu eyeliner OMG I forgot lol that's why the eyeliner is not in the pic! But most inexpensive item that I have in the pic is Wet n Wild's Megalast Lip Color. The most expensive one is Josie Maran's Coconut Watercolor Cheek Gelee. Eh, can I include beauty tool here? If yes, the most expensive one is Clarisonic Mia. I have a love/hate relationship with Maybelline's waterproof mascaras. I think Maybelline mascaras are the ones that can handle my eyelashes. They give volume, length, curl, drama in general. But they are hard to remove. I always lost 2-3 eyelashes every time I remove my mascara lol. Another one, Illamasqua lipstick in Sangers. I really like the finish and the color, but every time I use it I feel like it bring my whole face down. I look.. not fresh. Dull. I don't know. Maybe I just haven't got the right look to compliment the color. Hardest to get product.. Hmm.. I still haven't got the product yet to be honest. I'm not sure if I'm going to search for the item again or not because I think I already have too many lipsticks. By the way, the item is Rimmel Lasting Finish Matte by Kate Moss Lipstick shade 107. I don't eat my makeup but MAC lipsticks and NYX Soft Matte Lip Creams smells really good I wanna eat them. SLOTH: What beauty products do you neglect due to laziness? Highlighter. Hands down. I have oily skin, I think I don't need highlighter again because I'll automatically be shiny by the middle of the day. I only have this sample size Benefit Sunbeam highlighter and the one in Sleek Contour Kit. 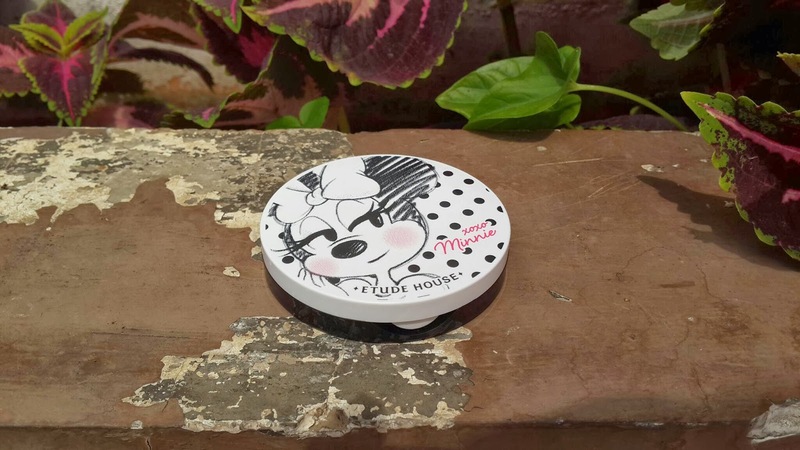 Eyebrow powder. I think it defines my face. LUST: What products do you lust after? YSL lipsticks! 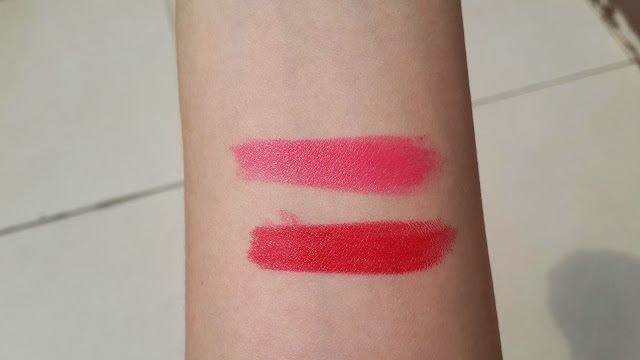 I used to only want Rouge Volupte but now I also want Rouge Pur Couture. Not good for the wallet, girls. Hm.. Can I put non-beauty item here? If yes, I want shoes, esp Manolo Blahnik's Swan hehe. If not, I'll go for lipsticks, blushers, and perfumes. Let's jump to the review. Right after application. Youthmud on the left, Supermud on the right. First I applied Supermud on right part of my face and then I applied Youthmud on the left part. Supermud dries up really fast, it looks like that after I finished applying Youthmud. Youthmud feels grittier than Supermud, I guess it's the exfoliating part. They both have minty scent but I say Youthmud smells fresher (with green tea scent) while Supermud is a bit muddy but still fresh. I have to tell you that Youthmud tingles. Not a lil tingle, it's more like almost-burning tingle. It's not burning but the tingle is definitely there and you can feel it. Don't say I didn't tell ya. Those of you who have sensitive skin, try it on little spot first ok. The tingle disappears after more or less 10 minutes tho. This is how it looks after 10 minutes waiting. The mask gets tight but not as tight as the other mud mask (*cough*aztecmask*cough*). See my T-zone on the Supermud part? The color looks different than the other part right? It's because the mud absorbs impurities and no doubt my T-zone is the most problematic part of my skin. After 10 minutes I washed my face just with tap water. I splashed a good amount of water to my face and rub both of the masks in circular motion to exfoliate my skin. Supermud doesn't require rubbing anything but I rub it too just to clean the mask. The fun part! The result! 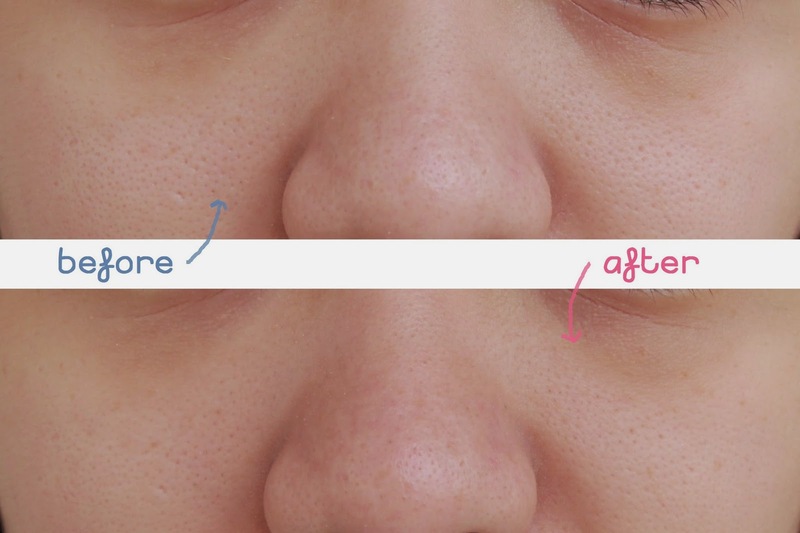 As you can see up there, before and after photo of my pores. You can see that my pores are reduced on both sides. I can feel some whiteheads when I touch my nose. I believe if I use pore pack right away I'll have them all stick to the pack. Too bad I ran out of pore packs that day. Sigh. And below you can see my dull skin gets brighter and looks healthier after the use. Conclusion: both masks did a very great job. They obviously live up to the hype. They perform more or less the same on my skin. The difference between the two are just the scent and the exfoliating beads. Both leave my skin smooth, soft, bright, and my pores reduced. GLAMGLOW Youthmud Tinglexfoliate Treatment and Supermud Clearing Treatment are available on Sephora here and here ($69, (almost) International). For Indonesia, GLAMGLOW Youthmud Tinglexfoliate Treatment and Supermud Clearing Treatment are available at GLAMGLOW boutique (Plaza Indonesia) and Beauty Box (Mall Kota Kasablanka, Mall Grand Indonesia, Mall Kelapa Gading I, Summarecon Mall Serpong I, Kalibata City, and Trans Studio Mall Makassar). Both retails for Rp780.000 each. 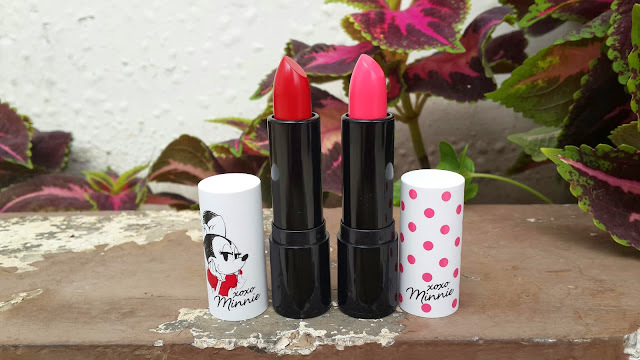 The lipsticks are creamy, pigmented, glides easily on the lips, stays for average time of creamy lipsticks (around 4 hours), not drying at all, and disappears after a meal. 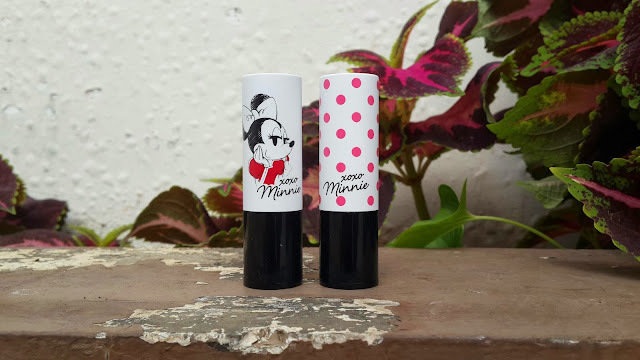 Just a little tip: if you're going to use lip balm underneath, make sure you use it at least 10mins before, blot the balm away (so the lips are moist without any remaining balm on top), and then use the lipstick. 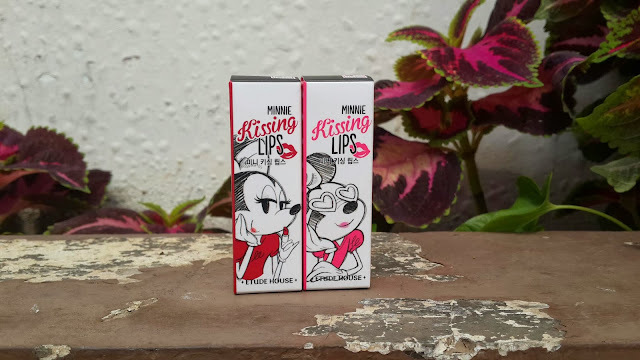 I find using the lipstick right after lip balm (I use Smith's Rosebud Salve) makes the color slips here and there so I don't get even application. Maybe it's because the lipstick itself is already creamy. I was a bit hesitant about the blusher. The color is just not something I'd use. 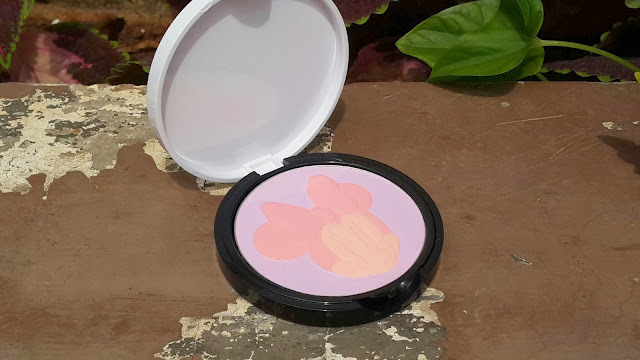 I mean, who use lavender-colored powder as her daily blush, sih? 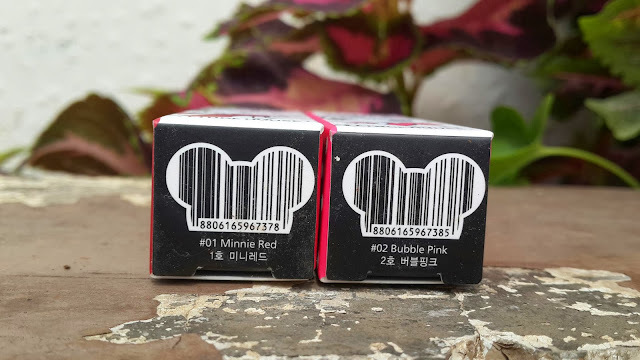 But for the sake of elegant Minnie face on the packaging and Minnie's face on the actual product, I bought it lol. Too bad the Minnie emboss fades away pretty quickly, but the shape is still there, tho. 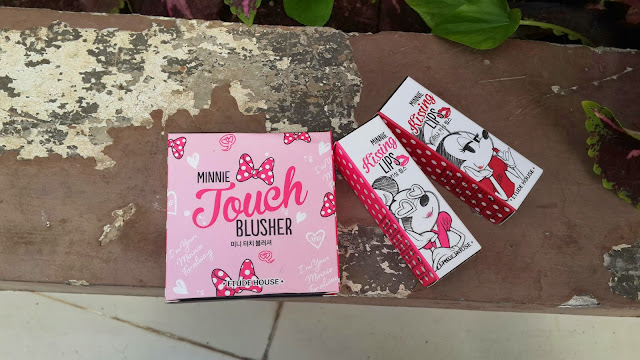 The blush is very soft, finely milled, but powdery. 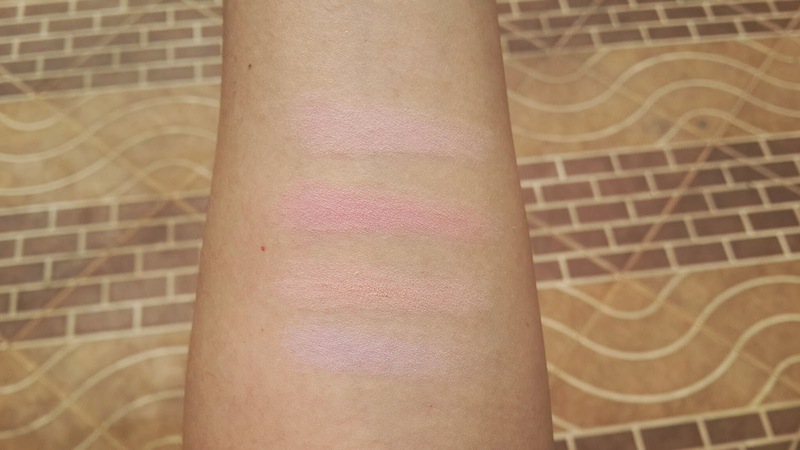 Once blended, the color is pale peachy pink. It stays on my cheeks for about 4 hours. Pigmentation wise, I say it's poor. It takes more than 3 swipes to get sheer swatch as the photo above. 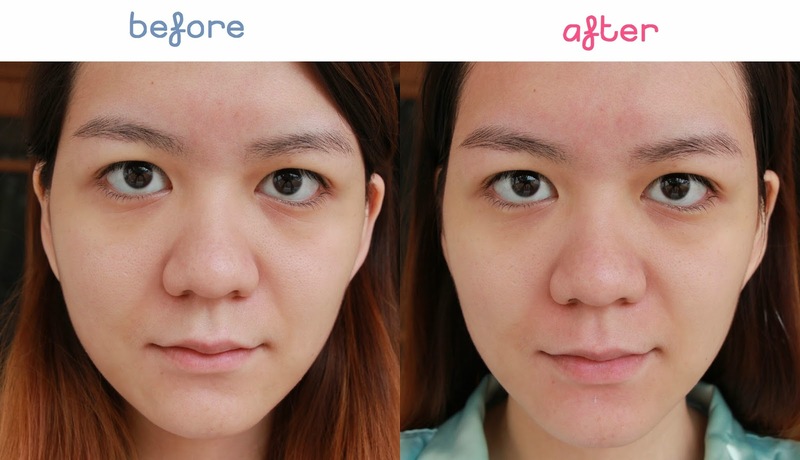 I'm not really into Korean makeup but I've heard somewhere that Korean makeups are usually not pigmented as Korean girls are usually fair-skinned and so into natural makeup. According to that information, I should say that maybe this blush would suit Korean girls better. For girls who have medium or dark skin, I don't recommend you to use this because it could look chalky. I usually use Sigma F10 to apply this on my cheeks and I need a lot of swipes to make the color shows on my skin. I guess this will be the first powder blush that I'll finally hit pan. Minnie Kissing Lips lipsticks are available on Chic Princessa (Rp102.000, Indonesia) and Beautynet Korea ($9, International). Just opened a few months ago, I can see PAUL has already gained some fanatic fans. I heard the line to be seated here can reach up to 2 hours of waiting. Me personally, have never heard this bakery named like one of my high school friend before until it opened a branch in my city. My friend who lived in Singapore for two years one year (wink to Vebbi) got super excited when she knew PAUL opened an outlet in Jakarta. She said PAUL's everything is very yummy. I got curious and finally a few days ago I went there. The place located on the outside part of Pacific Place's Galeries Lafayette. It wasn't too packed that day, no line needed to be seated but I didn't sit there because my friends have to go back to their offices as it's already passed the lunch time. PAUL have a few selection of eclairs, I go for framboise because I think it's unique. Anyway I just googled and figured that framboise is French word for raspberry. You're welcome. It's really good! The pastry is not hard at all, even after 2 days in the refrigerator. The cream and custard combination is to die for. They're not too sweet and very smooth. The raspberry gives a hit of sourness and makes the pastry very fresh as a whole. Recommended for you who are not a fan of sweet dessert. At first I was a bit hesitant about this tart. It looks dry on top but the center of it looks moist. But I think, "hey, it's PAUL! It can't be that bad. If it's bad I'll accept that as a lesson." Turns out this tart is SUPER GOOD. For me it feels like a very high quality brownie haha. But seriously, if you like chocolate, try this. It's not dry at all. The center part is fudge-like, the outer part is not so fudge-y but still very moist. I can taste the dark chocolate intensely when I eat the tart. I will go back to PAUL to get this again. I don't watch the show but I saw the red carpet pictures. Hands down Lupita and Kate Hudson have the best dresses. Usually people would post top 3 or top 5 or top 10 but not me. I think these girls stand out the most so I don't bother to look for another one. Lupita Nyong'o in Prada. Picture from here. Kate Hudson in Atelier Versace. Picture from here. Another old photo that I haven't post here.. I posted this photo on Clozette Daily for their first anniversary today's outfit, tho. Dress is from Forever21 and heels are from Freddie Freddie. The material of the dress is really nice, a bit thick and structured. The print is also very nice and not cheap looking. But there's something I'm not satisfied with, it's the zipper. It's exposed zipper type, you know, that big gold zipper that you can see clearly from a distance. Well that's not the problem (although I think hidden zipper would match this kind of dress better). The problem is the zipper feels cheap and flimsy. I used the dress once and then the zipper broke. Urgh. I know I can't complain too much because it is Forever21 and the price is very low but still, I thought it would be better. Now I need to bring the dress to seamstress to change the zipper.